All I can think to say is, omg omg omg these TACOS! This is another one of the recipes that I made early on in J and I’s relationship that didn’t get photographed, so I had to make them again. The crockpot has become my friend lately, especially now having access to one with temperature settings!! This is definitely a great crockpot recipe!! 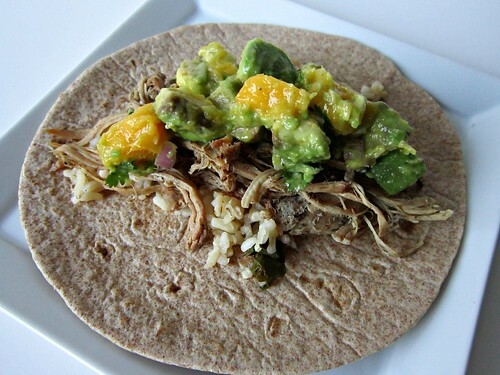 The jerk seasoning is great on the pork and the Caribbean salsa is the perfect creamy, citrus-y topping. Keep in mind that this does make a lot, so make sure you either have a crowd to feed or freeze the leftovers…you don’t want to waste any of it!! Remove pork and shred in a stand mixer or with two forks. Remove liquid from crock pot and reserve. Add shredded pork back to the crock pot, and about 1 cup of the reserved liquid, season with salt and pepper to taste. Allow to cook for about 15 more minutes. Meanwhile, cook the brown rice in the chicken broth according to the package instructions and make the Caribbean salsa by combining all the ingredients in a bowl. Season to taste with salt and pepper and refrigerate salsa until ready to serve. To assemble, warm tortillas and top with a few spoonfuls of rice, the pork mixture, and salsa. ENJOY! !